Dr. Frisch published a book on fertility in 2002. In 1974, Dr. Rose Frisch coauthored a paper for the journal Science showing that weight loss “because of injudicious dieting or excessive athletic activity, or both” could disrupt the reproductive ability of women. Lower fertility for women who were too thin, she believed, might be evolution’s signal that they shouldn’t attempt a pregnancy that could present dangers. “This could be nature’s way of protecting both mother and child,” she told the Globe in a 1979 interview when she described her studies of the athletes whose training interrupted their menstrual cycles. She worked closely with Olympic-level athletes with little body fat who had trouble conceiving, and some named their daughters Rose in appreciation, according to her son, Henry. Dr. Frisch, an associate professor emerita at the Harvard School of Public Health whose health had been declining, died Jan. 30 in the Cadbury Commons assisted living facility in Cambridge. She was 96 and lived in Cambridge most of her life. “She was a very brave person, a creative thinker, and a free spirit,” Barbieri said. Dr. Frisch’s early findings about weight and pregnancy were a key step toward later research that identified the hormone leptin, which helps regulate appetite, obesity, and puberty. Her subsequent studies found that moderate, regular exercise lowers a woman’s risk of breast cancer, reproductive system cancer, and late-onset diabetes. Dr. Frisch also advocated for exercise for young girls, saying it would help delay the onset of menstruation, which could prevent diseases later in life. Dr. Frisch, who received grants and awards throughout her career, also wrote a children’s book on nutrition called “Plants That Feed the World” and was passionate about population growth, as well as birth control and abortion rights. She spent many years with Harvard’s Center for Population and Development Studies. Rose Epstein was born in the Bronx, N.Y., in 1918, the youngest child of Louis Epstein and the former Stella Skolnick, immigrants who had fled Russia. Her older brother Lee, who changed his last name, was the father of Linda Eastman, the late wife of Beatle Paul McCartney. After graduating from high school, Dr. Frisch hitchhiked to Smith College, where she studied biology and graduated in 1938. While there she met David Frisch, a physicist, on a blind date. They were married in New York by his father, a Texas rabbi, and then both enrolled in the University of Wisconsin, where she received a doctorate in genetics and he worked toward a doctorate he completed later at the Massachusetts Institute of Technology. During World War II, they moved to Los Alamos, N.M., for the Manhattan Project that developed the atomic bomb, and she worked for physicist Richard Feynman. When her second child reached middle school, Dr. Frisch began working as a research associate at Harvard University’s population center. According to her family, even though she had a doctorate, she was paid just a few dollars an hour because, her superiors told her, her husband’s salary could support her. But Dr. Frisch wasn’t in it for the money, said her daughter, Ruth Dealy, an artist in Providence, and she wasn’t fazed by the “great deal of hostility” her ideas created among her mostly male peers. Dr. Frisch also was a keen storyteller who made a lasting impression. The novelist Ann Patchett met her in 1993, when both were awarded yearlong fellowships at the Bunting Institute in Cambridge. 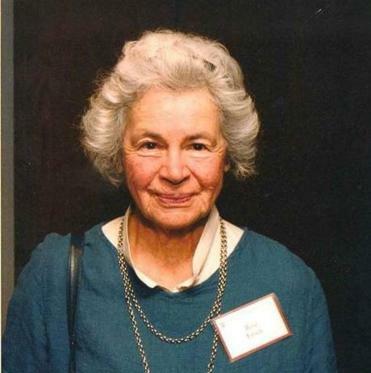 “She was a lovely woman, funny and kind, who was capable of making difficult science accessible,” Patchett wrote in an e-mail, recalling a presentation Dr. Frisch delivered on her research, as well as her stories about working on the Manhattan Project. Patchett borrowed Dr. Frisch’s physical characteristics as well. Both women were “small, soft, white-haired,” and also were “brilliant scientists who looked like somebody’s grandmother,” Patchett wrote. A service will be held for Dr. Frisch, who in addition to her son, daughter, and granddaughter leaves three other grandchildren and three great-grandchildren.